See the Service Price List page for prices on specific repairs. Good for bikes that are serviced regularly or that have not been ridden much. Bikes are functionally sound but may have issues such as brake rubbing, missed shifts, squeaky drivetrian. You like your bike a lot, you ride it whenever the weather allows and it gets to sleep inside. Annual service for bikes ridden often in the warmer / dryer monthsBikes need a bit more work than a general adjust and lube, bikes may have issues such as wobbly wheels, loose headset, hubs or bottom brackets, low brake performance. You love your bike. The two of you are faithful to the end but you want to treat it to some new duds to liven up that spark in the relationship. Bikes need multiple parts replaced due to wear or age. For those who really f**kin love their bike and want to treat it to a spa day at the bike shop. We’ll primp, curl and gossip about those other bikes at the group ride. And we’ll look fabulous! For road bikes needing a frame up overhaul including bearing installation and multiple replacement of parts due to wear or age. Annual Service for Full Suspension mountain bikes that see regular off road use. Was looking for a bike to ride basically to chase my beautiful grand daughters ages 5 and 3. Had an idea of what I wanted but, not really certain. They were awesome helped me pick the right thing and adjust it to my liking. Let me say after not riding a bike in over 30 years, I am totally in love with my new purchase! The service I received was top notch and no pushy sales pitch. - Lisa Waters. 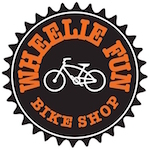 © Wheelie Fun Bike Shop 2019.